The singer made reference to forthcoming live dates in a message on Twitter, in which he attacked journalists for criticising his poor chart performance. In the summer of 2008 he had claimed he was giving up touring as he rounded off an extensive series of shows in which he played to more than a million people. George has returned to recording with a new single True Faith which debuted in the top 30 yesterday, one of his lowest chart placings for two decades. 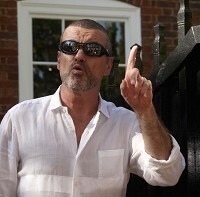 And as he dismissed critics on Twitter, he said: "Face it paps, hacks and haters... The album will sell great, the tour will sell out, and the fans remain some of the loyalest in the world." He then sent several more messages using expletives, saying his Twitter followers would increase if he swore. But his hints at a return to live work contrast with his comments in 2008 as he announced a pair of live concerts at Earls Court, which were dubbed The Final Two. "I think this is going to be about as good as I can possibly be - I think this tour is the best tour I have ever done and I think I want to stop doing it while it is at its absolute peak," he said in an interview with the BBC. He went on to play three live dates in Australia early last year. He was jailed later in 2010 for drug driving, spending a month in prison.